Ankara: An earthquake of 7.3 magnitude rocked eastern Turkey on Sunday, with a seimological institute estimating up to 1,000 people could lie dead under the rubble of dozens of collapsed buildings. The powerful quake, the strongest to hit the country in years, and its aftershocks struck Van, a large eastern city populated mainly by Kurds. “500 to 1,000 people are estimated to have been killed in the quake,” Professor Mustafa Erdik, director of the Kandilli seismological institute in Istanbul, told a news conference. Earlier reports did not speak of casualties but many were feared trapped under the rubble of collapsed buildings and officials warned they were struggling to assess the extent of the damage. At least 50 people were taken to hospital in Van, Anatolia news agency said. “There is serious human and material loss,” said a brief statement from the national disaster body which is based in the prime minister’s office. 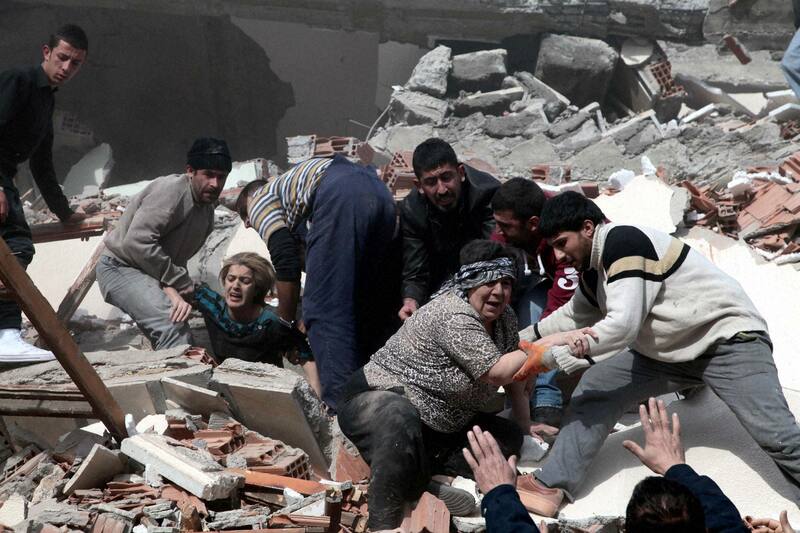 “Many multi-floor buildings, hotels and a dormitory were collapsed,” said Veysel Keser, a local official from Van. “We can hear voices from the collapsed buildings,” he said. Television footage showed collapsed buildings and vehicles, with residents rushing in panic in the streets. “People are panicked. The telecommunication services have collapsed. We cannot reach anybody,” Van Mayor Bekir Kaya told the NTV television in an initial assessment. The government is due to send satellite phones to the region, according to media reports. The army will also send search and rescue teams to the area. The US Geological Survey measured the quake at 7.3 magnitude and said that an aftershock was of 5.6 magnitude had also been registered. The epicentre of the aftershock, which occurred at 1056 GMT, was located 19 kilometers northeast of Van, the institute added. The depth of the initial quake was 7.2 kilometers, according to the US seismologists. The depth of the aftershock was 20 kilometers, they added. The epicentre of the quake, which struck around 1041 GMT, was at Tabanli in Van province, the Kandilli institute said. The Turkish institute said that there were two aftershocks which in particular impacted on Ilikaynak and Gedikbulak villages. Prime Minister Recep Tayyip Erdogan has cancelled his official programme and was due to visit the quake region, said NTV.